The big difference between your Raspberry Pi and your PC is that the Pi doesn't have a BIOS. It's the BIOS you see first when you turn on your computer – the retro-looking splash screen or the text detailing CPU, memory and storage, only it appears too quickly to read. If there's a problem with your PC, the BIOS can often be used to troubleshoot the booting, and it will also create noises and flash LEDs if bad memory or a dodgy CPU is detected. But without the facilities of a BIOS, the Raspberry Pi doesn't have the same level of fallback, and while hopefully your Pi will boot first time without problems, the more you play with your Pi, the more likely it's going to be that you encounter a boot problem. Which is what this guide to how to fix Raspberry Pi boot problems is for. Before we start know that every Pi before it leaves the Sony factory is tested, so if it's new and unwrapped it should work. The only way the Pi can impart diagnostic details is through the various LEDs it has on its board. Similar to the obscure BIOS beeps a big PC uses to wail its problems at you with potentially no working display. Each model of Pi sports its own array of LEDs. The original Model B had five, the A two and the latest Pi 2 also only has two. The number isn't really important as only one explains boot issues. First lets see which versions have what LEDs. The Model B sports five LEDs, while the Model A has only two, although the printed labels remain. On the Model A/A+ with no wired networking, the last three LEDs aren't present on the PCB, and you'll find the labelling is slightly different on earlier revisions of the Model B, although their functions are identical. When you first connect the Pi to a power source, the red LED2 should light. This indicates the device is getting the correct amount of power, and this LED should remain lit for the entire time your Raspberry Pi remains powered. Even when there's no network connection, or if the SD card isn't connected, this LED should stay lit. If it flickers, or if it goes off, you've got a problem with the way your device is being powered, and the first thing you should check is the cable and the power supply unit. The Pi 2 added detection for poor power supplies, so if the Pi detects an inadequate supply or a borderline one, the power LED remains unlit. With the SD card connected, the edge-side LED should be the next to light. This is the LED that signals that data is being read from the SD card. Initially, it will flicker on then off, pause for a moment, then pulse on and off again as the Raspberry Pi reads the boot code off the SD card. 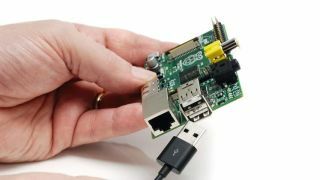 If it doesn't get that far, then the problem is going to be either that the boot code hasn't been correctly written to your storage card, or that your storage card isn't working with your Raspberry Pi. Be sure to check the card is seated properly and that any micro SD adaptor you might be using is connected. You can also check to make sure the connectors on the Raspberry Pi are springy and look identical, as there have been a few reported problems with these connectors.